Today on 28 May 2010 12 Years of Pakistan becoming First Muslim Nuclear Power are completed. Pakistan did six Nuclear Explosions on 28 May 1998 in reply two five Nuclear Explosion of India on 11 May 1998. After India did Nuclear Explosion on 11 May 1998 Tune of its officials and media changed against Pakistan and they starting threatening Pakistan. Watching this Pakistan did six Nuclear Explosions on 28 May 1998 which closed the mouths of Indian officials and Media. Every Year date of 28 May is celebrated as Youm Takbeer. 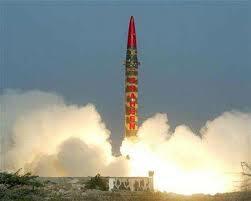 Pakistan started its Nuclear Program in 1975 after India decided to make Nuclear Weapons. Pakistan's Prime Minister of that time Zulfiqar Ali Bhutto said we will make Nuclear Bomb even if we will have to eat Grass. After Bhutto Zia ul Haq also continued work on Pakistan's Nuclear Program and Finally Pakistan was able to make Nuclear Weapons.Today Pakistan has far better Nuclear Missiles as compare to India.